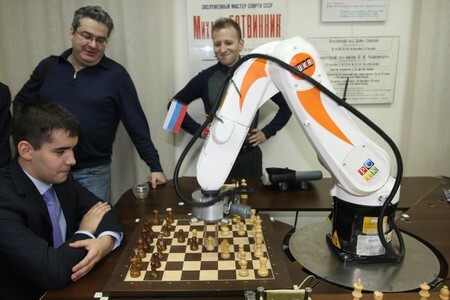 “Nepo” won the title by finishing level with Sergey Karjakin on 7/11 (4 wins and 1 loss), then drawing the three tie-break games, including the final “Armageddon” where his opponent had to win with the white pieces. Detailed information on the tournament can be found either in Russian at the homepage, or in English at TWIC. No doubt luck was on my side. 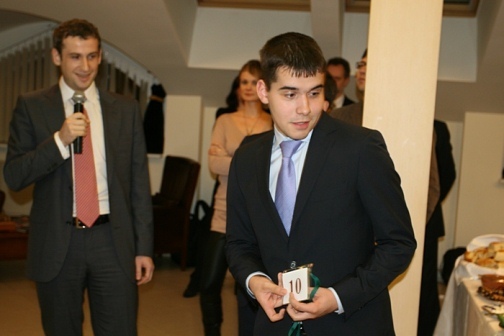 I needed to win in the final round against Nikita Vitiugov to improve my position, but I drew. However, Sergey Karjakin, who’d played very well in the tournament, played a poor opening and immediately got into complications. I realised I had a chance of catching Sergey and deciding the fate of the Championship in tie-breaks. That’s what happened. I saw I’d have a slight edge as Karjakin was exhausted after his game with Malakhov while I had more time to rest. Did you feel as though you could win? I believed in it. I’ve played and play a lot of rapid chess, and blitz games are something of a lottery. I also had the psychological advantage on my side. After all, Karjakin lost in the final round and got upset, realising he’d let first place slip at the very last moment. Now he had to start from scratch. In general it’s very hard to fight against Sergey. He’s simply playing excellent chess just now. We know each other too well. But in the first game I found a precise defence, and Karjakin couldn’t convert his extra pawn in the rook ending. In the second game I wouldn’t say that I seemed worse. Well, and the final battle… I admit that my position would have been hopeless at classical time controls. But I figured that it’s blitz, and my opponent was very tired. I held on and eventually won. What did you think when the clocks were stopped? It’s a long time since I’ve felt euphoria. Joy – yes. After all winning such a tournament, with such a line-up, is worth a great deal. Now I can relax a little and calmly face the New Year. I’d like to take the chance to wish all the readers of “Soviet Sport” a Happy New Year. 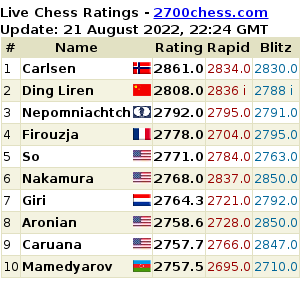 About five years ago chess experts said that three new talents had appeared on the world stage, three contenders for the World Championship title: Magnus Carlsen, Sergey Karjakin and Ian Nepomniachtchi, but later people said you’d fallen out of that race. Your play this year proves the opposite. Of course even back then it was flattering to hear that I was a gifted guy (laughs). That didn’t do me any good. All the wins came too easily and I was crushing my contemporaries without a struggle. At such an age it’s difficult to control your character. I experienced a long and protracted case of getting too big for my boots (lit. “star illness”). But, having matured, I’ve got over it. And now I’ve begun being tougher on myself and results have followed. During the time I was standing still Carlsen and Karjakin took a solid lead. Particularly Magnus. Now it won’t be easy for me to make up the lost ground, but the desire to play chess, and play it well, has reawoken in me. It’s not up to me where and on what board I play. I felt I was in good form and was comfortable playing on the first board. Khanty-Mansiysk boosted my confidence. Is it possible to say that you’ll now take part in the fight for the world title? In his childhood every boy wants to become a champion? That’s the last thing on my mind. It’s too early to talk about the Championship. I need to learn to beat top-grandmasters, to put up a few good performances at super-tournaments, and then it’ll be possible to think about the title. How many hours a day do you work on chess? It depends. Sometimes five-six hours, though there are periods when I don’t go near the pieces. But on average about three hours. That’s my girlfriend Jana. We’ve been going out for two years. Naturally, she was my most loyal fan here. I know that you’re really into computer games? Yes, I particularly like strategy games. Although, when I’m in the mood, I can also “shoot”. I spend a lot of time on the internet, studying chess-related literature. I haven’t even thought about it, but I’ve definitely given myself an excellent New Year’s present. The crucial game that gave Nepomniachtchi a chance of winning the tournament was his victory against an in-form (at least until that point!) Peter Svidler in Round 9. Nepo demonstrated the game, featuring a piece sacrifice, immediately after it finished, and his comments were transcribed by Mikhail Savinov in one of his excellent tournament reports (I hope to eventually redress the balance by translating a couple of Svidler’s entertaining commentaries on his wins!). 1.e4 e5 2.Nf3 Nc6 3.d4 exd4 4.Nxd4 Nf6 5.Nxc6 bxc6 This is all theory, so not very interesting. 6.e5 Qe7 7.Qe2 Nd5 8.c4 Ba6 9.Nd2 g6 A move that’s apparently more correct than castling long. 10.Nf3 Qb4+ 11.Kd1 Nb6 After this move Black, no doubt, has no objective problems, but 11…Rb8 seems more accurate to me. The knight doesn’t look good on b6 and the a6 bishop also does nothing for Black’s position, although all of that, of course, is compensated for by the fact that the white king is stuck in the centre. A roughly equal position, though the possibility of h4-h5 acts on Black’s nerves. Here, it seems to me, you should play 16…Bb7, but Peter rushed a little, playing 16…d5. After that Black ends up in a worse endgame by force, although with correct play it should also end up as a draw. 17.exd6 Qxd6 18.Bxg7 Qxd2+ 19.Nxd2 Kxg7 20.Ne4 Nd7 21.Rd1 No doubt this wasn’t the best move, as Black didn’t have any real problems. Perhaps it was more accurate to play 21. h5. 21…Bb7 22.Nc3 There’s nothing after 22.Rxd7 Bxe4+ and then Rac8, and Black is very solid. 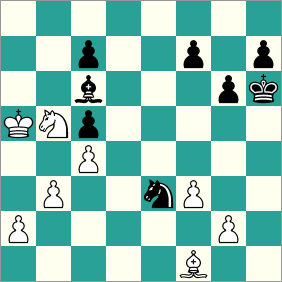 22…Nf6 23.f3 Rfe8 24.Bd3 White had another, slightly extravagant, possibility: 24.Na4 Re5 25.Nb2. 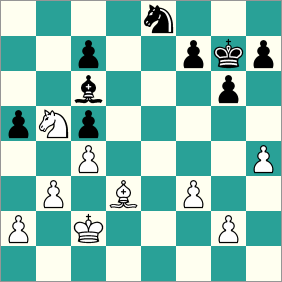 Although here as well there’s nothing much: 25…Rae8 26.Nd3 Rf5, and it’s not clear where White’s advantage lies. Here Peter made a mistake. 24…a5? A very risky move. It has a point if Black manages to play a4 and create some counterplay, but otherwise the pawn becomes very weak. No doubt it would have been better to play 24…a6, and that’s another story. 25.Rhe1 Bc6 26.Nb5 There’s nothing after 26.Ne4 Nxe4 27.Bxe4 Bxe4+ 28.Rxe4 Rxe4 29.fxe4 a4. 26…Rxe1 It was possible to consider the pawn sacrifice 26…a4. 29.Kb2 White sets off after the a5 pawn. Black could only survive based on counterplay. Here I looked at two replies for Black. 29…Kh6 Perhaps the most forceful move, but it struck me as stronger to play 29…Kf6 with the idea of 30.Ka3 Nd6!? 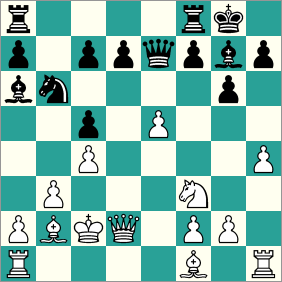 31.Nxc7 Ke5 or 31.Ka4 Nb7, although here you have to look at 32.Be4 – perhaps that wins. 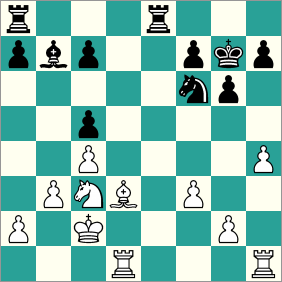 30.Be2 Ng7 Here Black had the interesting possibility 30…g5 31.hxg5+ Kxg5, and on 32.g3 – 32…Ng7. I don’t know what the evaluation is here – you’d have to look at it with a computer. 31.Ka3 Nf5 32.Ka4 Nxh4 33.Bf1 Nf5 There’s no particular point playing 33…Nxf3 34.gxf3 Bxf3 – Black would need to advance two pawns, White – only one, and would clearly get there first. 35.Nxc7 This was my idea – White sacrifices a piece. 35…Nxf1 36.Kb6 Bd7 This move loses immediately, while the consequences of 36…Bxf3 37.gxf3 Nd2, were something I couldn’t calculate to the end. In principle White should win here as well – in any case I can play 38. Kxc5 and put the king in the queening square. 37.Nd5 It was also possible to play 37.Kxc5 Ne3 38.a4 Nxg2 39.a5, but the move in the game is more forceful. 37…Kg7 (on 37…Nd2 there would follow 38.Kxc5) 38.a4 Bc8 (38…Kf8 39.Kc7) 39.Ne7 Black resigned.